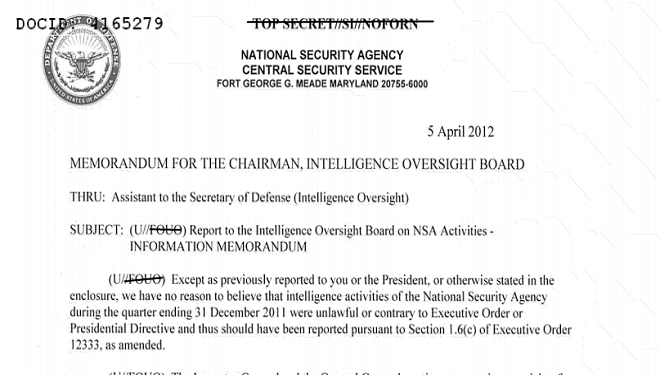 Pages of Intelligence Oversight Board (IOB) papers were released by the National Security Agency (NSA) on Christmas Eve. These previously top secret documents show hundreds of instances of the NSA unlawfully spying on Americans and how the rights of citizens have been violated during the last decade. 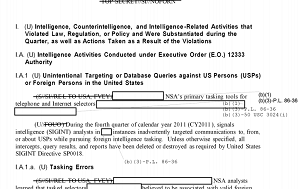 While most of the documents are heavily redacted, the IOB reports shows how routinely and easily the NSA “unintentionally” collects data on citizens of the United States. The files are a collection of annual and quarterly reports sent to the President’s Intelligence Oversight Board from the NSA’s inspector general. The cache of files date back to 2001. The NSA is forced to publish the reports in order to comply with a lawsuit that was filed by the American Civil Liberties Union. The Freedom of Information lawsuit compels the NSA to make public copies of the IG’s findings. “Although the investigation is ongoing, the analyst has been advised to cease her activities,” continued the report. As Bloomberg noted, the surveillance yielded nothing. The NSA claims it is such ill-trained staff, human errors and flaws in software which have led to the policy breaches that illegally subjects innocent US citizens to NSA surveillance. The NSA claims that it goes to “great lengths” to comply with laws and regulations. The recently released pages reveal that in certain instances when the agency admitted to wrongfully targeting American citizens, the data was destroyed. However, the report also showed how, in some instances, wrongfully collected data was handed to people who were unauthorized to have access to such information. Of course the timing of when the NSA decided to publish the report must not be ignored. Christmas Eve is of course a day when most people are busy wrapping presents, spending time with family and generally getting ready for Christmas Day. Releasing these heavily redacted yet highly damning files on Christmas Eve could be seen as a ploy to have the intelligence collection released when a large majority of Americans were not looking. It could also be argued that the IOB reports prove how the NSA redacts and hides behind security to muddy the waters of how severe this issue really is.